On the 7th April 1902 the city council of Copenhagen voted to make awards annually for "beautiful artistic designs for construction projects on the city's land." There had been some discussion with the Association of Academic Architects about creating an award that recognised the best designs for new buildings in the city but from the start the awards were also to provide guidelines or a model and an incentive for owners and clients when they commissioned work. It is important to understand that the council appreciated fully the importance of historic buildings in the city so the awards were, in part, to encourage the design of new buildings of an appropriate quality to stand alongside the historic buildings but they also went further to include awards for major projects for the restoration of existing buildings and to recognise improvements to the townscape or urban scape that provided the best and most appropriate setting for those buildings. 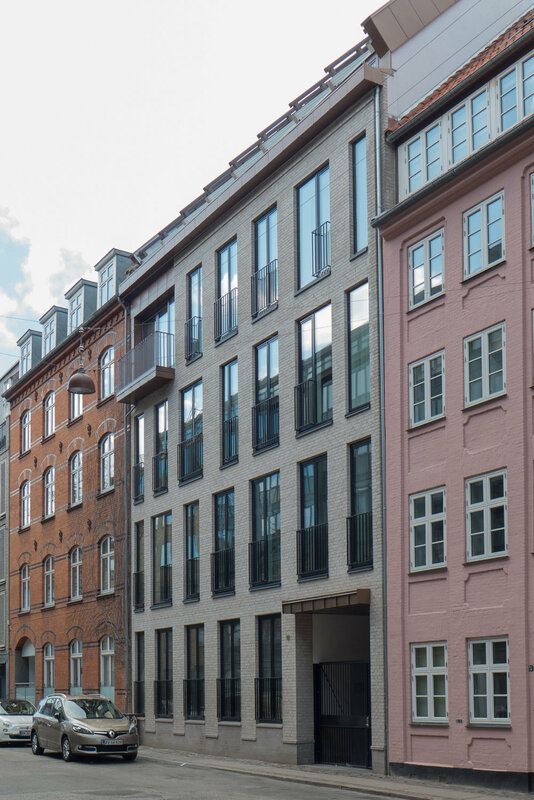 Nor did the awards just focus on major or prestigious buildings but over 115 years they have also recognised the best private houses, new apartment buildings and commercial buildings, factories and schools in Copenhagen. For 2018, eight buildings have been recognised with an award but, for the first time, these will all go forward for the selection of an overall winner by a public vote. That winner will be announced at a ceremony at the City Hall on 3 May. Five circular towers, tightly grouped and interlinked, with shops and a cafe at the lower level, a new public space at an upper level between the towers, offices and a restaurant at the top overlooking the city. The nomination for an award appears to be in part for the quality of the exterior and for the new or rather the replanning of the public space running back from the street across the west side of the new buildings. Apartments on an important and sensitive site overlooking the JC Jacobsen Gardens. The award appears to be for the quality of the design, attempting to set a standard for the redevelopment of this area, previously the site of the Carlsberg brewery. There is an interesting loggia across the street frontage that takes its form from covered links between and across the front of original brewery buildings and the form of the brickwork, with panels of bricks set diagonally to create a zigzag dog-tooth pattern, shows a clever and sympathetic and appropriate respect for the facade of the adjoining brick building on the garden side by Eske Kristensen that dates from the 1960s and was itself an award-winning design. New youth housing in buildings on Margreteholm that date from 1939 - an early and important concrete post and beam construction that has been derelict for some years. Prominent new building for medical research - for the university Panum Institute and the Novo Nordisk Foundation Centre on the Faculty of Health and Medical Sciences site. The award, in part, seems to recognise the technical aspects of the building, particularly energy saving for such a large structure; in part recognises the complex planning for such a complicated high-tech role and in part is for the landscape around the building that takes into account controls for surface water - as cloud bursts become more common, and potentially much more destructive with climate change - but also has interesting planting and a dramatic use of elevated public walkways to encourage people to enter the site or cut through. An 18th-century palace - designed by JG Rosenberg and close to the royal palace and the Marble Church - has been restored for Danmarks Apotekerforening / Denmarks Pharmaceutical Association following an extensive fire in 2010. The award recognises that because the building is so important, restoration work was completed using original materials with original working techniques. Apartment building constructed on a plot in the historic centre of the city close to the King's Garden that has been vacant since 1970 when a number of old houses were demolished ahead of a major scheme to rebuild the street that was then abandoned. Prestigious apartments and a roof-top restaurant in the conversion of a concrete silo for grain that was the largest industrial building in the North Harbour. The challenge was to give the building a relevant and financially viable function to justify its survival; respect the scale of the building, with what are exceptional heights between the floors, and to retain qualities and the drama of the raw concrete of the original building but bring the spaces up to current standards of insulation. Housing in the conversion of a former DLG silo close to the Silo. The industrial building was given a distinctive framework of balconies on three sides and the award recognises the quality of the apartments - “the decor and the choice of materials” but also appreciates that the design has created “liveable” homes particularly in terms their orientation to the natural light. There is a page on the web site of Københavns Kommune - under Housing, Construction and Urban Life - on the Building Awards that has information about each of the nominated buildings with photographs, including some interiors, and a short video for an assessment of each of the projects by the City Architect Tina Saaby (in Danish).